The Springfield (Delco) field hockey team needed overtime to beat Ridley, 2-1, on Tuesday. 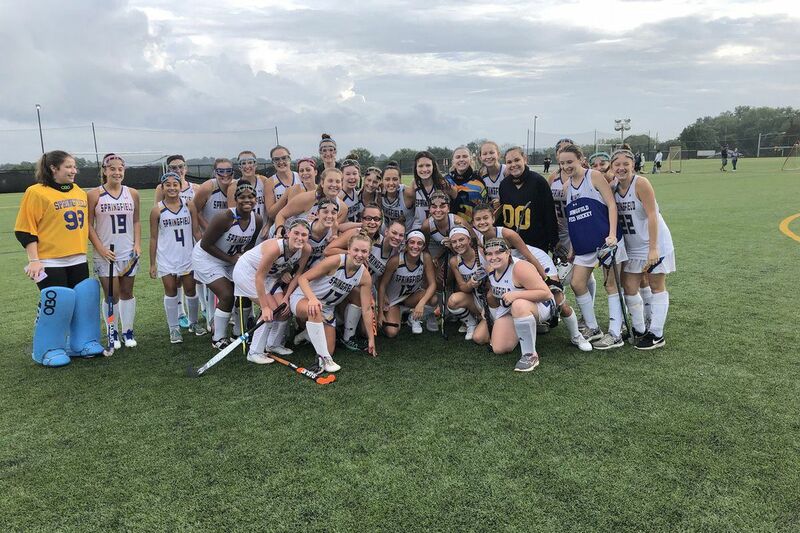 Eliza Donaldson's overtime goal gave the Springfield (Delco) field hockey team a 2-1 victory over Ridley on Tuesday. Gabby Herschell recorded four goals and two assists in Phoenixville's 6-0 win over Pottsgrove. Emma van der Veen notched four goals as Agnes Irwin cruised past Penn Charter, 7-1. Danielle McNeely's header early in the second half propelled Strath Haven past Radnor, 1-0. The Panthers improved to 8-2 on the season. Regan Nealon scored off of a Madelyn Kalish corner with 11 minutes remaining to give Garnet Valley a 1-0 win over Marple Newtown. Abby Groff netted two goals as Pennridge beat North Penn, 3-2. Lindsey DeHaven scored the other goal for the Rams. Matty Harmon and Bradan Mallon found the back of the net in Hatboro-Horsham's 2-1 triumph over Plymouth Whitemarsh. North Penn received goals from Carter Houlihan, Luke McMahon, and Ryan Stewart in a 3-0 victory over Pennridge. James Kamal and AJ McIntyre had two goals apiece as Lincoln held off Frankford, 6-2. Great Valley exploded for three goals in the second half to beat West Chester East, 3-2. Ethan Williams made it 3-1 with 20 minutes remaining when he fired a left footed laser low into the corner of the goal. Bishop Shanahan remained undefeated as they traveled to Ches-Mont League foe Avon Grove and won in straight sets. The Eagles, who recorded 26 aces, improved to 7-0 overall and 6-0 in the league. Thomas Lonergan Jr. has been named the new varsity girls' basketball coach at Pope John Paul II. Lonergan amassed six years of coaching experience from Central Bucks East and most recently Gwynedd Mercy Academy under head coach and father, Tom Lonergan. His coaching philosophy is one of hard work, attention to detail and maintaining a high level of energy and enthusiasm both on and off of the court.